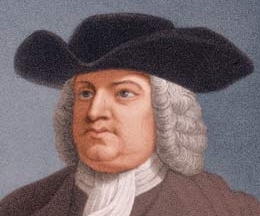 [William Penn (1644-1718), founder of Pennsylvania, as a young man joined the persecuted sect of Friends, or Quakers, despite the opposition of his father. As a leader of this group he became interested in the management of the Jerseys, then largely under Quaker control and, in the later days of Charles II, secured the grant of Pennsylvania, including three counties now in Delaware. Penn then set about attracting settlers for the new colony and later, after consultation with Algernon Sidney and other friends, drew up the "Frame of Government" and a penal code far in advance of his time. Actually the governmental structure here provided for proved unworkable and, within a year, was supplanted. Only in 1701, with Penn's "Charter of Privileges," was the proprietary government established upon the formal basis on which it continued to 1776. When the great and wise God had made the world, of all his creatures it pleased him to choose man his deputy to rule it; and to fit him for so great a charge and trust, he did not only qualify him with skill and power but with integrity to use them justly. This native goodness was equally his honor and his happiness; and whilst he stood here, all went well; there was no need of coercive or compulsive means, the precept of divine love and truth, in his bosom, was the guide and keeper of his innocency. But lust prevailing against duty made a lamentable breach upon it; and the law, that before had no power over him, took place upon him, and his disobedient posterity, that such as would not live comformable to the holy law within should fall under the reproof and correction of the just law without in a judicial administration. This the Apostle teaches in divers of his epistles: "The law," says he, "was added because of transgressions." In another place, "Knowing that the law was not made for the righteous man; but for the disobedient and ungodly, for sinners, for unholy and profane, for murderers, for whoremongers, for them that defile themselves with mankind, and for manstealers, for liars, for perjured persons," etc. ; but this is not all, he opens and carries the matter of government a little further: "Let every soul be subject to the higher powers; for there is no power but of God. The powers that be are ordained of God: whosoever therefore resisteth the power, resisteth the ordinance of God. For rulers are not a terror to good works, but to evil: wilt thou then not be afraid of the power? Do that which is good, and thou shalt have praise of the same." "He is the minister of God to thee for good." "Wherefore ye must needs be subject, not only for wrath, but for conscience' sake." This settles the divine right of government beyond exception, and that for two ends: first, to terrify evildoers; secondly, to cherish those that do well; which gives government a life beyond corruption and makes it as durable in the world, as good men shall be. So that government seems to me a part of religion itself, a thing sacred in its institution and end. For, if it does not directly remove the cause, it crushes the effects of evil and is, as such (though a lower, yet), an emanation of the same Divine Power that is both author and object of pure religion; the difference lying here, that the one is more free and mental, the other more corporal and compulsive in its operations; but that is only to evildoers; government itself being otherwise as capable of kindness, goodness, and charity, as a more private society. They weakly err that think there is no other use of government than correction, which is the coarsest part of it: daily experience tells us that the care and regulation of many other affairs, more soft, and daily necessary, make up much of the greatest part of government; and which must have followed the peopling of the world, had Adam never fell, and will continue among men, on earth, under the highest attainments they may arrive at, by the coming of the blessed Second Adam, the Lord from heaven. Thus much of government in general, as to its rise and end. First. That the age is too nice and difficult for it; there being nothing the wits of men are more busy and divided upon. It is true, they seem to agree to the end, to wit, happiness; but, in the means, they differ, as to divine, so to this human felicity; and the cause is much the same, not always want of light and knowledge, but want of using them rightly. Men side with their passions against their reason, and their sinister interests have so strong a bias upon their minds that they lean to them against the good of the things they know. Secondly. I do not find a model in the world, that time, place, and some singular emergencies have not necessarily altered; nor it is easy to frame a civil government that shall serve all places alike. I choose to solve the controversy with this small distinction, and it belongs to all three: Any government is free to the people under it (whatever be the frame) where the laws rule, and the people are a party to those laws, and more than this is tyranny, oligarchy, or confusion. But, lastly, when all is said, there is hardly one frame of government in the world so ill designed by its first founders that, in good hands, would not do well enough; and story tells us, the best, in ill ones, can do nothing that is great or good; witness the Jewish and Roman states. Governments, like clocks, go from the motion men give them, and as governments are made and moved by men, so by them they are ruined too. Wherefore governments rather depend upon men than men upon governments. Let men be good, and the government cannot be bad; if it be ill, they will cure it. But, if men be bad, let the government be ever so good, they will endeavor to warp and spoil it to their turn. I know some say, "Let us have good laws, and no matter for the men that execute them"; but let them consider that, though good laws do well, good men do better, for good laws may want good men and be abolished or evaded [invaded in Franklin's print] by ill men; but good men will never want good laws nor suffer ill ones. It is true, good laws have some awe upon ill ministers, but that is where they have not power to escape or abolish them, and the people are generally wise and good, but a loose and depraved people (which is the question) love laws and an administration like themselves. That, therefore, which makes a good constitution, must keep it, viz. : men of wisdom and virtue, qualities that, because they descend not with worldly inheritances, must be carefully propagated by a virtuous education of youth; for which after ages will owe more to the care and prudence of founders, and the successive magistracy, than to their parents, for their private patrimonies. These considerations of the weight of government, and the nice and various opinions about it, made it uneasy to me to think of publishing the ensuing frame and conditional laws, forseeing both the censures they will meet with from men of differing humors and engagements and the occasion they may give of discourse beyond my design. But, next to the power of necessity (which is a solicitor that will take no denial), this induced me to a compliance: that we have (with reverence to God, and good conscience to men), to the best of our skill, contrived and composed the frame and laws of this government, to the great end of all government, viz. : To support power in reverence with the people, and to secure the people from the abuse of power; that they may be free by their just obedience, and the magistrates honorable, for their just administration; for liberty without obedience is confusion, and obedience without liberty is slavery. To carry this evenness is partly owing to the constitution and partly to the magistracy; where either of these fail, government will be subject to convulsions; but, where both are wanting, it must be totally subverted; then where both meet, the government is like to endure. Which I humbly pray and hope God will please to make the lot of this of Pennsylvania. Amen. To all persons to whom these presents may come. Whereas, King Charles the Second. . . hath been graciously pleased to give and grant unto me, William Penn,. . . all that tract of land, or province, called Pennsylvania, in America . . . I, the said William Penn, have declared, granted, and conformed. . . these liberties, franchises, and properties, to be held, enjoyed, and kept by the freemen, planters, and inhabitants of the said province of Pennsylvania for ever. XXIII. That no act, law, or ordinance whatsoever shall at any time hereafter be made or done by the governor of this province, his heirs or assigns, or by the freemen in the provincial Council, or the General Assembly, to alter, change, or diminish the form, or affect, of this charter, or any part, or clause thereof, without the consent of the governor, his heirs, or assigns, and six parts of seven of the said freemen in provincial Council and General Assembly. XXIV. And, lastly, that I, the said William Penn, for myself, my heirs, and assigns, have solemnly declared, granted, and confirmed, and do hereby solemnly declare, grant, and confirm, that neither I, my heirs, nor assigns, shall procure or do anything or things, whereby the liberties in this charter contained and expressed shall be infringed or broken; and if anything be procured by any person or persons contrary to these premises, it shall be held of no force or effect. In witness whereof, I, the said William Penn, have unto this present character [sic] of liberties set my hand and broad seal, this five and twentieth day of the second month, vulgarly called April, 2 in the year of our Lord one thousand six hundred and eighty-two. Grab your success in act practice test - Wireless Associate - IUWNE CCNA Wireless with latest CBT from Test King. Get marvelous success through getting online Cisco 000-281 Dumps CCNA Wireless dumps from Pass For Sure. Audio lectures and Pass4sure CCNA Wireless 70-410 Cisco class room are perfect options for your marvelous success. All the people who have used P4S study tools have really found them to Cisco 640-554 practice tests and guidance for the exam. You are required to trust 642-999 preparation tools completely and have a complete usage of them for final exam preparation.